i have had many of you emailing me asking when our new die will be released. the plan was to release it friday, this is also our VIP night at the new store. If you know me at all i change the plans ALL the time so today is your lucky day........A few details first. There will be NO discounts on this die. Reward dollars can not be used either. The die will not ship untill MID NOVEMBER>>>if you pre-order it, it will be charged to your card(sorry). Orders will ship in the order we receive them. Finally....this is VERY limited....We did not order as many of these as we did the castle, so once they are gone they are gone. Please leave a comment. I would like to know what you think! This is precious. Definitely a must have for me. Great job on the design. I cannot wait to order this die, along with your castle. They will be great to scrap the pictures that I will take at Disney next month! My 5 yr old and I got so excited over this new die. We can hardly wait. 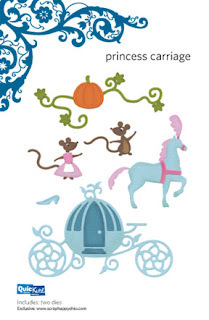 We have the perfect Cinderella pictures for it. She notice that you even had "Jack" the mouse that helps Cinderella. GREAT JOB !!! !